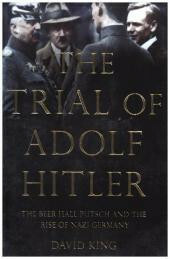 Produktinformationen "The Trial of Adolf Hitler"
The story of the Courtroom drama that triggered the rise of the Nazi party. Includes never-before-published sources, this richly informed, day-by-day account shows how Hitler transformed into a mesmerizing demagogue and used his trial as a stage for Nazi propaganda. Chilling in the hypothetical question it raises, The Trial of Adolf Hitler illuminates our understanding of Hitler's path to power.